In what follows I will try to offer a literary alternative to the murderous, supersessionist versions of the story that animates the site. The textual and the physical sites that appear so recalcitrant and exclusive are actually interwoven, more elastic and artificially constructed than they appear in contemporary theological or political discourse. So if we can solve the textual conundrum, we may be able to resolve the conflict on the ground. My argument is that the symbolic status of the city—a wandering signifier—was born at the same time as the material edifices. And that the topocentric need for what Mircea Eliade would have called an axis mundi continues to compete with more spacious, inclusive, and self-conscious linguistic and ethical flexibilities hidden in plain view in the constitutive text. Literary archaeology has the advantage of keeping your hands clean, even while you are paging through a text that is thousands of years old. It can, like later appropriations in the midrash and in other monotheistic traditions, be twisted or squeezed to yield various versions and meanings, but the text itself is always there to be rediscovered. A literal reading of the story will highlight certain structural and narrative quirks that determine the genre and contain the secret of the akeda. Genesis 22 begins very theatrically, like the Book of Job: “And it happened after these things that God tested Abraham.” This is a wink behind Abe’s back to the audience, who is given some assurance that the old man will pass the test. In what follows we may be forgiven if we forget the stage wink as we get caught up in the unfolding tragedy. J. William Whedbee, in his study The Bible and the Comic Vision, follows Northrop Frye in calling the U-shaped plot pattern the telltale curve of the comic. According to Frye, this pattern entails “action sinking into deep and often potentially tragic complications, and then suddenly turning upward into a happy ending” (qtd. in Whedbee 7).13 Disaster averted at the last minute through divine intervention is the Hebrew version of deus ex machina. The structural seemingly needs no elaboration. We all know that Genesis 22 ends with Isaac’s release, yet we repeatedly repress that knowledge so that Isaac can continue to animate our tragic imagination. From the description of Isaac’s “death” and “resurrection” in the midrash14 through nearly every modern Israeli version—and through all its appropriations in Christian iconography—the akeda is apprehended as an accomplished sacrifice. In fact, the occlusion of the happy ending in Genesis 22 is fundamental to the evolution of the genre of tragedy as sacrifice; safeguarding the place of the sacrificed son, the pharmakos—Isaac or Jesus—is tantamount to safeguarding the very “idea of the tragic,” as Terry Eagleton argues in Sweet Violence. So unearthing the comic structure in the place of ultimate sacrifice becomes a subversive act. In this most serious of texts the comic muscle is flexed, then, in its every permutation.15 I will illustrate with only one more passage, which replicates Abraham’s response—this time as slapstick or shtick. When Sarah, who is listening at the tent entrance, hears the annunciation given again to her husband, she repeats Abraham’s response: “So Sarah laughed inwardly, saying, ‘After being shriveled, shall I have pleasure, and my husband is old?’ Then the Lord says to Abraham, ‘Why is it that Sarah laughed [lama ze tzahakah Sara], saying, ‘Shall I give birth, old as I am?’ Is anything beyond the LORD?’. . . And Sarah dissembled, saying, ‘I did not laugh [lo tzahakti],’ for she was afraid. And He said, ‘Yes, you did laugh [lo ki tzahakt]’” (Gen. 18.12–15). Although one can really ham this passage up, in the manner of domestic farce,16 something very consequential is transpiring here. I see this as the beginning of the Jewish version of the Divine Comedy17 as it is passed down from the biblical narrative in Genesis to Philip Roth’s story “Conversion of the Jews.” The exchange manifested hilariously in Sarah’s incredulous laughter, and God’s put-down, actually points to a disparity that will remain fundamental to the Jewish conception of the comic: despite the miracles that are regularly performed throughout the five books of Moses, especially in Genesis and Exodus, there is a healthy Jewish suspicion about any supernatural intervention that disrupts the normal processes of nature. God may be all-powerful, but parturition on the part of a ninety-year-old woman raises the same skepticism as Immaculate Conception will over a thousand years later. Nevertheless, the laughter intensifies, darkens, and then fades as the story proceeds. After the twenty wordplays on his name, Isaac’s laughter disappears altogether, as if his near-death experience effaced whatever good humor he had.18 Posttraumatic stress disorder is, after all, a far more powerful reflex than humor. But one can conclude from the convoluted ways in which the biblical story plays out here, and in future histories,19 that the very essence of Yitzhak’s name is manifest in the test that Abraham, and his descendants, actually failed: what was at stake was belief in a God who would desire child sacrifice, or for that matter, any human sacrifice. No, the story states simply, God—the tarrying deus ex machina—would actually prefer the comic version of human history and human-divine relations. Der Mensch tracht, und Gott lacht (man proposes, God disposes [literally, man schemes, God laughs]). Kafka’s Abraham, humbly anti-Kierkegaardian, is the ultimate comic figure, one who cannot obey the call-from-without because he is too embedded and obligated in this world. The “sacrifice” of Isaac moves, then, from a remembered “event” to an existential posture. Psychotic memory abolishes the wedge that distance and deferral provided. “[The] secret of the sacrifice of Isaac,” Derrida tells us, is the “space separating or associating the fire of the family hearth and the fire of the sacrificial holocaust” (88). (The “whole-burnt offering” that Abraham was to offer in the form of his son is called olah in Hebrew—holocaustum in the Latin Vulgate.) Negotiating that space, between the family hearth—the Kafka/Derrida quotidian—and the fire of the sacrifice, is, then, the forgotten secret. Fig. 1. Rosh Hashanah greeting card; back jacket of Yehuda Etzion’s Alilot ha-mufti ve-ha-doktor. With permission of William Gross. Because this site was occluded from view and inaccessible to Israelis, because there really was space between the family hearth and the fire of the sacrifice, the Temple Mount was overshadowed by other physical shrines that constituted the “official” Israeli landscape after the establishment of the state in 1948: Yad Vashem and Mount Herzl as memorial sites, the Knesset as the site of modern Jewish sovereignty, and the Israel Museum as a shrine to ancient and modern art.26 Since the Israeli victory of 1967, however, as messianic fervor has grown, all memorial and sacramental activity has converged on the Wailing Wall, with the Temple Mount as site of ultimate aspiration. Along with our loss of boundaries, that is, there has also been the loss of space between us and the sacred center—and, crucially, the loss of our sense of humor. I suggest, then, an alternative that has always been there, that is consistent with a literal, even “fundamentalist” reading of Genesis 17–22 and of the memory site it animates: a spacious, comic negotiation between the material and the divine, with faith in, but without the hope of, final resolution. In a speech before the United States Congress in 1994, Jordan’s King Hussein declared, “My religious faith demands that sovereignty over the holy places in Jerusalem reside with God and God alone . . .” (qtd. in Molinaro 17).27 The smiles I imagine on congress members’ faces at the king’s appeal to divine intervention to pacify the squabbling sons of Abraham are the rare signs of our stubborn faith—tested regularly by events on the ground—that politics, like poetry, can be a site where memory yields to magic and comedy defeats tragedy. Alter, Robert. The Five Books of Moses: A Translation with Commentary. W. W. Norton, 2004. Ben-Arieh, Yehoshua. Ir Be-rei ha-tekufa: Yerushalayim be-meah ha-19 [The City in Its Historical Context: Jerusalem in the Nineteenth Century]. Yad Ben Zvi, 1976. Berger, Pamela. The Crescent on the Temple: The Dome of the Rock as Image of the Ancient Jewish Sanctuary. Brill, 2012. Studies in Religion and the Arts. Calder, Norman. “From Midrash to Scripture: The Sacrifice of Isaac in Early Islamic Tradition.” Le Muséon, vol. 101, no. 3-4, 1988, pp. 375–402. Caspi, Mishael, and John T. Greene, editors. Unbinding the Binding of Isaac. UP of America, 2007. Cohen, Amnon. “1516–1917: Haram i Şerif, the Temple Mount under Ottoman Rule.” Grabar and Kedar, Where, pp. 210–30. Cohen, Hillel. Tarpa’t: Shnat ha-efes ba-sikhsukh ha-Yehudi-Aravi [1929: The Zero Hour of the Jewish-Arab Conflict]. Keter Books, 2013. Darrow, Robert Arnold. “Kierkegaard, Kafka, and the Strength of ‘The Absurd’ in Abraham’s Sacrifice of Isaac.” Electronic Theses and Dissertation Center, Wayne State U, 2005, etd.ohiolink.edu/rws_etd/document/get/wright1133794824/inline. Derrida, Jacques. The Gift of Death. Translated by David Wills, U of Chicago P, 1995. Eagleton, Terry. Sweet Violence: The Idea of the Tragic. Blackwell Publishers, 2003. Etzion, Yehuda. Alilot ha-mufti ve-ha-doktor: Ha-siah ha-Yehudi-Muslimi be-noseh har ha-bayit ‘al reka pera’ot tarpa’t [Plots of the Mufti and the Doctor: The Jewish-Muslim Discourse on the Temple Mount as Background to the Riots of 1929]. Sifriyat Beit El, 2013. Ezrahi, Sidra DeKoven. “After Such Knowledge, What Laughter?” Interpretation and the Holocaust. Special issue of Yale Journal of Criticism, vol. 14, no. 1, 2001, pp. 287–317. ———. Booking Passage: Exile and Homecoming in the Modern Jewish Imagination. U of California P, 2000. ———. “From Auschwitz to the Temple Mount: Binding and Unbinding the Israeli Narrative.” After Testimony: The Ethics and Aesthetics of Holocaust Narrative. Edited by Susan Suleiman, Jakob Lothe, and James Phelan, Ohio State UP, 2012, pp. 291–313. ———. 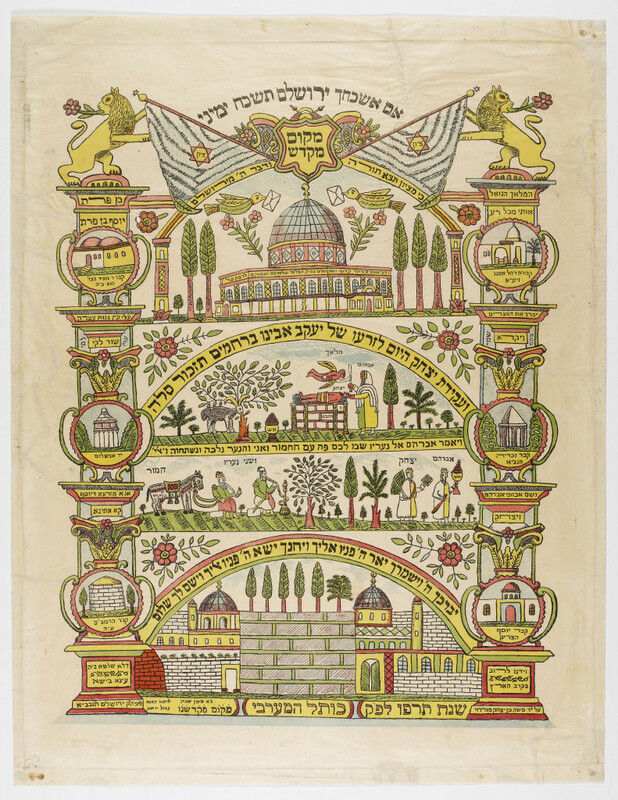 “‘To What Shall I Compare You?’: Jerusalem as Ground Zero of the Hebrew Imagination.” PMLA, vol. 122, no. 1, Jan. 2007, pp. 220–34. Fishbane, Michael. Biblical Interpretation in Ancient Israel. Clarendon Press, 1985. Frye, Northrop. Fables of Identity: Studies in Poetic Mythology. Harcourt, Brace and World, 1963. Goldhill, Simon. The Temple of Jerusalem. Harvard UP, 2005. Wonders of the World. Grabar, Oleg, and Benjamin Z. Kedar. Introduction. Grabar and Kedar, Where, pp. 9–13. ———, editors. Where Heaven and Earth Meet: Jerusalem’s Sacred Esplanade. U of Texas P, 2010. Jamal and Rania Daniel Series. Greenberg, Rafi, and Yonathan Mizrachi. “Mi-silwan le-har ha-bayit: Hafirot archeologiot ke-emtza’i le-shlita; Hitpathuot—bekfar silwan u-ve-ir ha-atika shel yerushalayim be-shnat 2012” [From Silwan to the Temple Mount: Archaeological Digs as Means of Control; Developments in Silwan and the Old City of Jerusalem in 2012]. Emek Shaveh, alt-arch.org/en/from-silwan-to-temple-mount. Accessed 29 Nov. 2014. Hurowitz, Victor Avigdor. “Tenth Century BCE to 586 BCE: The House of the Lord (Bayt YHWH).” Grabar and Kedar, Where, pp. 15–34. “Ishmael in Islam.” Wikipedia: The Free Encyclopedia. Wikimedia Foundation, 9 Aug. 2015, en.wikipedia.org/wiki/Ishmael_in_Islam. “Israel and the Occupied Palestinian Territory” The Carter Center, www.cartercenter.org/countries/israel_and_the_palestinian_territories.html. Accessed 23 Oct. 2014. The Jerusalem Bible. Koren Publishers, 1992. Kafka, Franz. “Abraham.” The Basic Kafka. Washington Square Press, 1979, pp. 170–72. Klein, Menachem. Jerusalem: The Contested City. Hurst, 2001. Levenson, Jon D. The Death and Resurrection of the Beloved Son: The Transformation of Child Sacrifice in Judaism and Christianity. Yale UP, 1995. Mackay, Cameron. “Zechariah in Relation to Ezekiel 40–48.” The Evangelical Quarterly, vol. 40, no. 4, 1968, pp. 197–210. Biblical Studies.org.uk, biblicalstudies.org.uk/pdf/eq/1968-4_197.pdf. Maimonides, Moses. The Guide of the Perplexed. Translated by Shlomo Pines, introduction by Leo Strauss, 2 vols., U of Chicago P, 1974. Makiya, Kenan. The Rock: A Tale of Seventh-Century Jerusalem. Vintage, 2002. Ma‘oz, Moshe, editor. The Meeting of Civilizations: Muslim, Christian, and Jewish. Sussex Academic Press, 2009. Mizrachi, Yonathan. Letter to the UNESCO executive board. 19 Apr. 2016, http://alt-arch.org/en/wp-content/uploads/2016/04/Emek-Shavehs-Response-to-UNESCO-Executive-Board-199th-decision.pdf. Accessed 1 May 2016. Molinaro, Enrico. The Holy Places of Jerusalem in the Middle East Peace Agreements: The Conflict between Global and State Identities. Sussex Academic Press, 2009. The Noble Qu’ran. www.quran.com. Accessed 12 Nov. 2014. Perloff, Carey. “Tragedy Today.” PMLA, vol. 129, no. 4, Oct. 2014, pp. 830–33. Persico, Tomer. “The Temple Mount and the End of Zionism.” Haaretz, 29 Nov. 2014, www.haaretz.com/news/features/.premium-1.628929. ———. “Why Rebuilding the Temple Would Be the End of Judaism as We Know It.” Haaretz, 13 Nov. 2014, www.haaretz.com/news/features/.premium-1.626327. Reiter, Yitzhak, and Jon Seligman. “1917 to the Present: Al-Haram al-Sharif / Temple Mount (Har ha-Bayit) and the Western Wall.” Grabar and Kedar, Where, pp. 230–73. Rippin, Andrew, editor. The Qu’ran: Formative Interpretation. Ashgate, 1999. Schwartz, Hava. “National Symbolic Landscape around the Old City of Jerusalem.” Hebrew U of Jerusalem, 2013. Shalev, Meir. Reshit: Pe-amim Rishonot Ba-Tanakh [In the Beginning: First Steps in the Bible]. Am Oved Publishers, 2008. Whedbee, J. William. The Bible and the Comic Vision. Cambridge UP, 1998. Yuval, Yisrael. “God Will See the Blood: Sin, Punishment, and Atonement in the Jewish-Christian Discourse.” Jewish Blood: Reality and Metaphor in History, Religion and Culture, edited by Mitchell B. Hart, Routledge, 2009, pp. 83–99. Zucker, David J. “Isaac: A Life of Bitter Laughter.” Jewish Bible Quarterly, vol. 40, no. 2, 2012, pp. 105–10, jbq.jewishbible.org/assets/Uploads/402/jbq_402_isaaclaughter.pdf. Sidra DeKoven Ezrahi is professor emerita of comparative literature at the Hebrew University of Jerusalem.